The elements that inspired me - the black stamped butterflies, the over-stamped background, and the black and white sentiment panel (I reversed the colours). 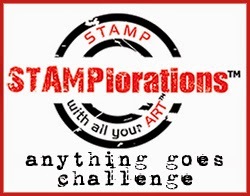 My starting point was this ARTlorations 'stencil used as a stamp' background, which I had made using distress inks. I sprayed it with gold perfect pearls and then stamped around the edges with various stamps using Delicata Gold ink. The sentiment was white embossed on black card and cut to a banner shape, and layered over another banner cut from the gold paper. This final shot shows the detail of the butterfly, the black rhinestone, and the background stamping. I did not use the black layer that was on the inspiration card, but I did sponge black ink around the edge of the panel. That's FANTASTIC Maxine ! Just beautiful! This is so pretty, Maxine!! Great colors and I love all the shimmer on the background. Ohhhh, this is so beautiful!!! I just love it, and the gold butterflies are fabulous! Wow! This is absolutely gorgeous. Love the butterflies and the shimmer. WOW, what a great background to those butterflies. What a lovely background and such pretty butterflies. Thank you for the sweet comment you left on my blog for me. What a lovely grungy card! Love the butterflies too! Hope you will have a sunny week! Maxine this is stunning! really wonderful! WOW! This card is amazing! Love the grungy look! Super lovely butterflies! TFS at WAW this week - I wish you the best in the draw! Such great shimmer and texture! OOoooo! This is a beautiful card, Maxine! I love how artsy it is - the background is so shimmery and glamorous! This card is a winner for sure! WOW, how cool are those metallics! Love The Embossing .. Thanxx For Playing With Us This Week At Lil Patch ..
woohoo I like this effect. Oh, I love the shimmer in this card, and the way the cute little butterflies sit off the paper. I think the black is a really nice contrasting touch to the green and brown shimmers.